This especially attractive desert poppy is found across the Mojave Desert and into the northern Colorado Desert, especially along the Colorado River between California and Arizona. 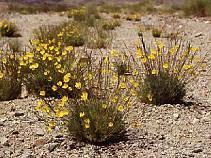 Like E. lobbii, it is scapose, but it is much larger in stature, with larger deep yellow flowers. The foliage is gray-green. 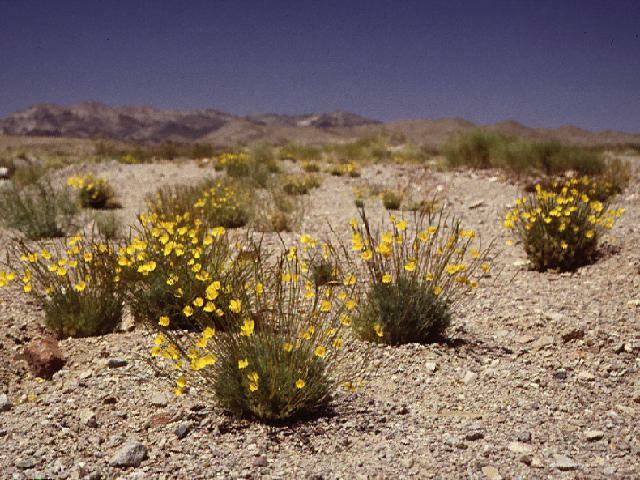 The plants are often found in washes, and their brown pitted seeds (glyptosperma means "sculptured seed") are very buoyant and most likely dispersed by floodwaters. The seeds also have a very strong dormancy, which currently impairs the use of this species in cultivation. Eschscholzia glyptosperma is a close relative of E. parishii, probably deriving from it by chromosome additions and rearrangements. PLANT annual, 0.5-2.5 dm tall, erect, glaucous or glabrous. LEAVES basal, terminal divisions acute. INFLORESCENCE solitary. FLOWERS nodding in bud; receptacle conic; calyx acute, glabrous or glaucous; petals 1-2.5 cm long, yellow. FRUITS 4-7 cm long. SEEDS 1.2-1.8 mm diam, spherical, pitted, tan to brown. 2n=14. Desert washes, flats, and slopes; 50-1500 m. Mojave Desert; w AZ, s NV, sw UT.